This is also an old assignment for T&V, here I needed to change a object into a letter. 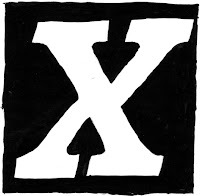 Again I had letter X. In this assignment we needed to paint everything in gray and black white and make the morphing in 4 steps. I made the morphing slowly change and the light gray back to become darker and darker. 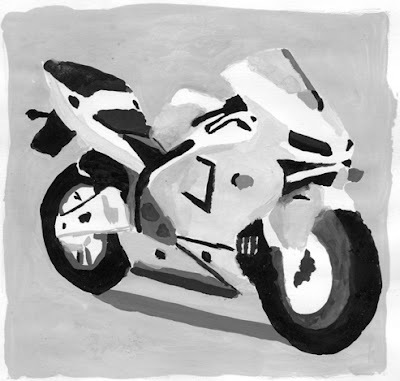 In the first picture I painted the same bike from the writing Honda assignment. In the second picture you can see its still the bike but with a odd shape. 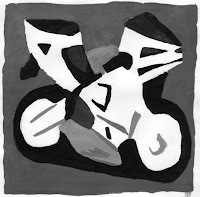 In the third you clearly see the X and partial things that resembled things from the bike. 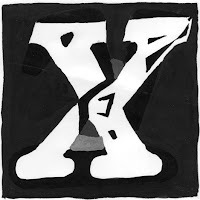 And the last one it become clearly the letter X. For this assignment I've got a 9 for it, because of the clear and good morphing method and a very clean paintings.